Some say, they live beyond the blue of the infinite firmament. They say, someday one will descend and use her strange powers to challenge the evil crouching on the world below the clouds. With hail and lightning, with blank fists* and blessed with the powers of the Blind Goddess - the clouddancer, her heart pumping the blood of the long forgotten silver dragons that once swept the sky! - When hitting 'Create', Torchlight II might crash 1-3 times. At least on my computer, don't know why. - Clouddancer and Cloudcat skins unfortunately share with the BigCat and the Outlander. Haven't managed gettin them separate. - I've repainted/recolored some textures so that they fit the clouddancer. They will look horrible on male characters, if you know what i mean. The Clouddancer is build for fighting UNARMED and with spells. Of course you can equip weapons (you have Onslaught as a skill), but with a dragon seal equipped in higher levels, you probably don't need any weapons. Her unarmed damage is also imbued with the elements! The damage done when having the full clouddancing set equipped can get very high, so i suggest experienced players starting with the next difficulty level. There are some class-specific uniques and almost all armor pieces give your clouddancer additional boni. There are Essences waiting to be drunk. They're tasty! Yes, i reduced customizing options to ensure the clouddancer looks like one. Bare with me! Feedbacks, comments, critiques, all are welcome! I hope the download works for you guys, my webspace is pretty slow. NOTE: If you use something from this mod that is created by me (Bran) or Runic Games, don't claim that to be created by your own, because it is not. This is for the special guys that are falsely taking all the credit. You hereby have been warned. Awesome mod bran, if you need any help troubleshooting those problems follow up at www.fareastexpansion.com and go to forums ==-> Sign up and i'll make you a beta tester, we have some class problems too sometimes, but we have a group of troubleshooters that will help you! Will you be adding a male version? Also you can use the instructions I gave you to give her punches while unarmed. Join us at http://torchboard.org/forum/index.php to discuss the Far East Expansion! No, the clouddancer was meant to be a female-only class. And again thanks for your messages, when i have some time, i'll repaint the two face-textures for you. I love the kicking animations, I just like to cycle more than 3 attacks even more. Thanks Bran for the textures! I must admit Bran, I am disappointed that you never make male characters. I live with a wife and 3 daughters, so I never have any desire or willingness to play a female in a video game. As always your textures look great though from what I see in the portraits. I must admit Bran, I am disappointed that you never make male characters. I remember a time when I painted or modelled only male characters, and believe me, someday it got boring as ****. Additionally it seems to me, that in video games overall there are waaaaayyyy more male heroes/protagonists (most of them looking pretty... standardized) than female ones - so i can't really see something evil in creating an _optional_ female-only class. Well, at least that's only my personal opinion. I live with a wife and 3 daughters, so I never have any desire or willingness to play a female in a video game. Why let real life dictate what to play in games? I mean, games are entertainment, nothing more, aren't they? Yes they are for fun, and why I don't condemn anyone who plays female or male characters. I have plenty of male friends who only play female characters. To each their own. Hey bran, I'm glad you're back. Your work look great. You're still working on another project? I was waiting for it, I really like the tribal coloring. It looks cool. 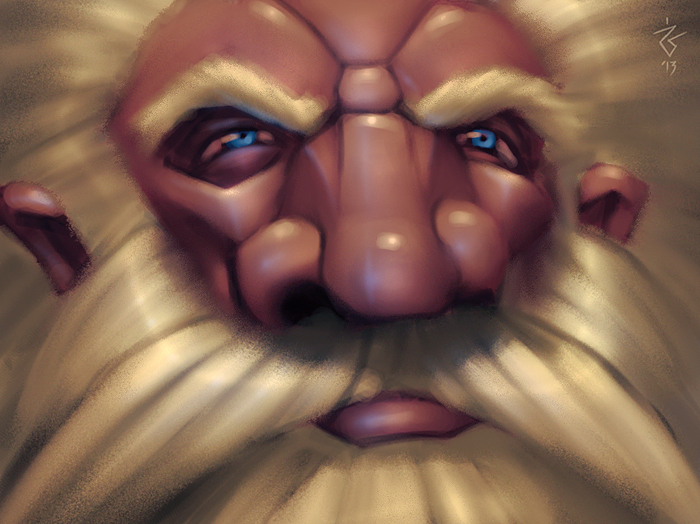 And I like your dwarf ... 35 min... I am sad and envy your talent! Nice mod man. I am going to give this a try with the far east mod i think instead of synergies. Oh...are the frosted hills and slavers stockade glitches fixed yet? Unfortunately not, sorry for that. :? Actually, it is 'only' the estherians - when freeing them, they offer not loot to choose, and you can't leave the loot window without choosing a loot. Alt+F4 + restarting the game is one (annoying) option - or simply don't free them, though it is sad, but they don't affect the main quests. I have paused the barbarian because of too much problems, so i decided to make the clouddancer as a smaller mod to share at least something with the community. But it does not mean it is abandoned - simply need a bit more time and more experience with guts before continuing with the barbarian. As long as you let the class inherit one of the base class types in unittype, it should solve the issue with the Estherians. Thanks for the tip, man! That could be the case, because the clouddancer inherits only from the clouddancer_base. Or is there an easier way to get loot available from the estherians? You can now free the Estherians in the Frosted Hills and the Slavers Stockades, pick loot and continue adventuring. Hi Bran! Can you give a little more detail of how you did this? Did you have to rework your whole class (like you said in your previous post)? Another class, thank you ! I'm going to give it a try ! Basically, that's all. I had to add the clouddancer loot spawn classes (simply copied/renamed them from the embermage and selected the appropriate loot) to about 30 spawn classes. - some tests with a human healer as a pet, sadly it turned out it does absolutely nothing except for walkin around and lookin good, what is very, VERY annoying! Feedback, comments & critiques always welcome! Do you think i should stick with that style...? :? Thats an awesome look man. Those claws are beautiful. I must say that I find them extremely impressive. Did you build the model yourself, or alter one in game? Are they Animated? Still, I LOVE the design.